Show + Tell: TIMES SQUARE AFTER SUPER BOWL! TIMES SQUARE AFTER SUPER BOWL! I made a motherly decision that Jennifer and I should be safe in our hotel room by the time the Super Bowl game was over Sunday evening. We had a long day of working our booth and I was feeling a bit cautious. That is, until the Giants won! We were in our jammies and I could hear and see helicopters above and people below from our window. 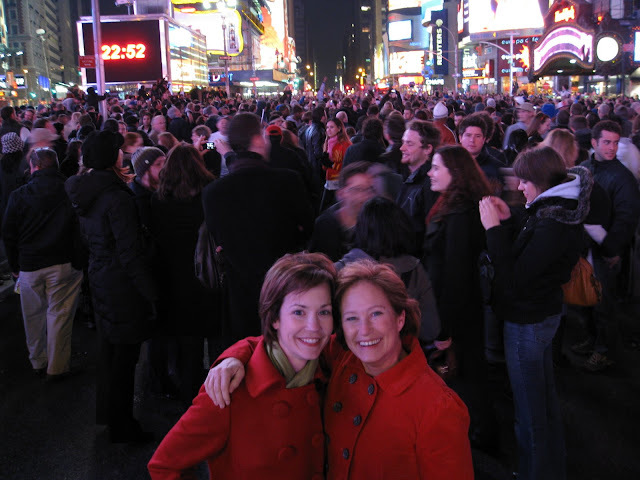 I threw caution to the wind, broke my own rule and in a few minutes we were out on Times Square with half of New York! Our Colts and Peyton didn't make it this time, so it was great to see Eli win. And to think, we almost missed this moment. The New York Show is over now and we're finally back at work today. We made several new friends and our products will soon be in many stores throughout the Eastern states and Canada. Each day was a blur and we had little time to do much away from our booth, but all we did see were layers of incredible colors, textures and patterns at every turn.